Momentum Driving School, owned by Mark Hall, cover a wide area of the UK. They are committed to the highest standards of teaching to ensure that students pass their driving test in the most cost-effective way possible. Momentum were looking for a way to notify driving instructors out on the road of new lessons booked on their behalf. Momentum use our Email to SMS service which allows them to send SMS directly from their email accounts back at the office. Momentum have seen a massive reduction in the amount of missed appointments, as instructors get a direct alert when a new appointment has been made. 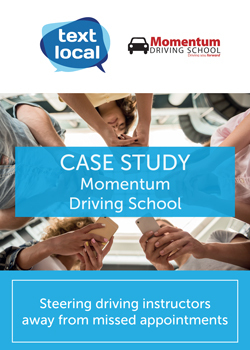 Download and find out how Momentum Driving School have managed to reduce the amount of missed driving lesson appointments using SMS. We were struggling with communicating efficiently with our driving instructors via email. Email to SMS has allowed us to automate the process of notifying our instructors when new work is booked, which has resulted in a huge decline in missed appointments and lost sales.